You are currently browsing the tag archive for the ‘biodiversity Marrickville LGA’ tag. Pelicans at dusk in Marrickville. How beautiful is this! 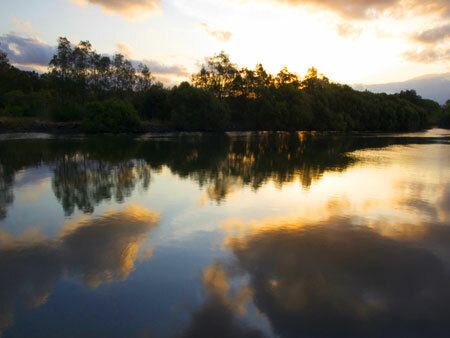 Marrickville Council have put out a YouTube video called – ‘Water is Life.’ It is an excellent video with a tremendously positive message that speaks strongly to me about my own hopes for the area in which I live & love. Well done to Marrickville Council & to everyone involved. I feel uplifted & hopeful after watching this. 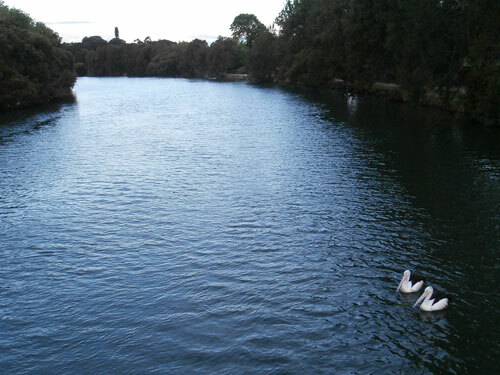 The Cooks River is a jewel in Marrickville municipality. – 7 of these were about ‘seasonal infestation’ by Cotton Harlequin Bugs with 1 resident also writing about Rosella nests & possible bird lice. – 2 were about flower litter with 1 resident adding that the seedpods produce ‘glass-like’ hairs causing skin irritations & get stuck in their feet. This street tree in Harrow Road was unique for having so many Cotton Harlequin Bugs on its trunk. 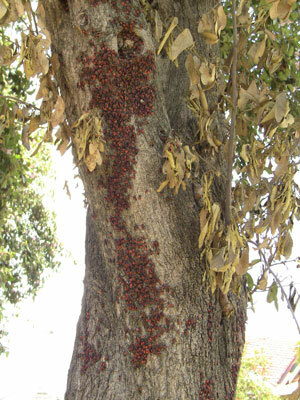 Not all the street trees had visible bug families & some had one or two small clusters of bugs sitting on the trunk. This tree was one of the 3 trees that had bead branches at the base or on the trunk. Many bird species are all through these trees, eating nectar & feasting on insects. With the amount of birds that I witnessed during 2 visits, thought really needs to be given that any new planting will produce food for the birds. 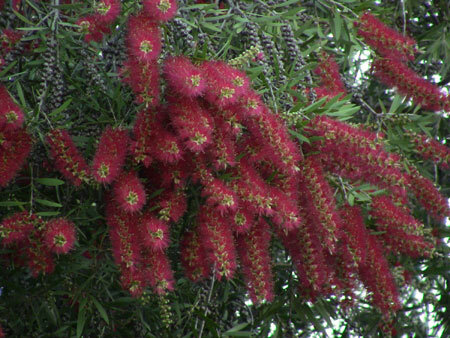 Council has recently started planting a new variety of Bottle Brush that looks spectacular, but flowers for a maximum of 3 weeks & interestingly, the birds don’t pay the flowers much attention. The flowers are probably all colour & pizzazz, but low producers of nectar. The Norfolk Island Hibiscus has recently been added to the list of ‘exempt from protection’ trees in the Marrickville Development Control Plan 2011. 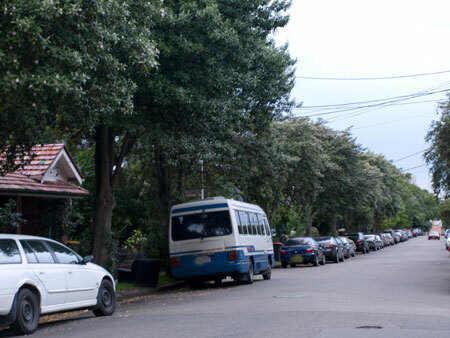 However, their Draft DCP 2010 (the only one I could find) says Council may refuse to grant consent to remove trees if, “The tree is part of a wildlife corridor or provides habitat for wildlife; and/or the reason for removal is substantively aesthetics/emotive & relates to leaf, flower, seed &/or twig drop.” I would say that these trees in Harrow Street fulfill all these criteria. Norfolk Island Hibiscus trees are on many Australian councils lists of recommended street trees. 1. Trident Maple (Acer buergeranum) – A native of China, that grows to 5-20 metres high with a canopy of 6-7 metres & produces yellow flowers in spring. The seeds are known colloquially as ‘whirly-gigs’ because they have papery ‘wings’ & can fly long distances in the wind. 2. Claret Ash (Fraxinusangustifolia ‘raywood’) – A cultivar of the Ash tree predominantly found in Europe, Asia & North America & grows to 15-20 metres. The dark green leaves turn claret red in autumn. It’s described as having invasive roots. The WA Water Corporation recommends planting no less that 6-metres from a sewerage pipe. 3. Jacaranda (Jacaranda mimosifolia) – A native of South America that grows 12-15 metres high x 8 metres wide & produces lavender bell-like flowers during spring. Jacarandas drop a large amount of leaf & flower debris as well as tough seed pods 5-7.5 cm in diameter. It’s described as having invasive roots. 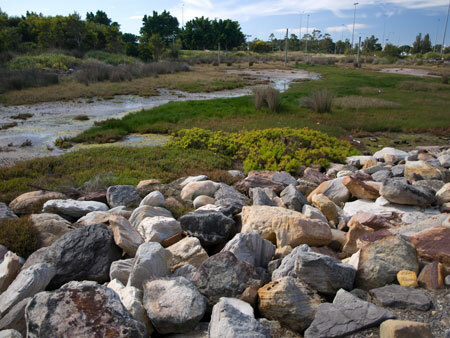 The WA Water Corporation recommends planting no less than 6-metres from a sewerage pipe. 4. Golden Rain Tree (Koelreutaria paniculata) – A native of China & Korea that grows 10-metres high & 10-metres wide. Produces yellow flowers in autumn 5-8 mm diameter seeds that look like Chinese paper lanterns. As the petitioners do not like flower, leaf & seed litter & one resident thinks the tree roots may be damaging their property, I suspect the choices for replacement trees will also cause them concern. I am not a subscriber to planting only native trees, as I believe that many non-natives can be very useful to wildlife & I actually like the trees suggested. However, in this case none of the replacement trees offer any value to Australian wildlife that I am aware of. On 15th November 2011 Council approved its Biodiversity Strategy. 3 weeks later they are recommending that Councillors vote to remove a whole street of trees of high habitat value & replace with street trees of no habitat value whatsoever. We spoke to 2 residents. One appeared angry with me taking photos of the trees & shouted, “I love these trees.” The other had no notice of a push to have the trees removed. The first thing they said was, “But the Cotton Harlequins live in them.” They were very distressed & said they would write to Council. The residents who have put in the petition know, but the remaining residents in the street do not seem to know & I think this is important. Council should be sending a letter to every household in Harrow Road informing of the petition & hold a public meeting at a good time on the weekend to speak to the residents about this. Leaf, flower & seed debris & Cotton Harlequin Bugs are not issues of concern to every Harrow Road resident. To my mind there is already a problem with Marrickville Council’s processes in that the removal of so many street trees is decided without community consultation. To remove the trees & then give the community a choice from 5 tree species isn’t real community consultation. It’s the leftovers. Harrow Road is a long road with many more than 27 residents. They deserve a say. Lastly, 1 tree has a large drill hole at the base of its trunk & appears to have been poisoned & 2 other trees next to it also show multiple dead branches at the base & on the trunk & perhaps this is also a sign of poisoning.